Gulfport. Her disfigurement is the result of an attack by a tiger shark during a dive to the wreck of a World War Two German submarine sank during the war by the U.S. Navy off the coast of Chandeleur Island. During a two year recovery period the scientist becomes convinced the attack was orchestrated by someone who wanted to steal the formula for a shark repellent being developed at the research lab. The repellent, if perfected, would be worth billions of dollars. 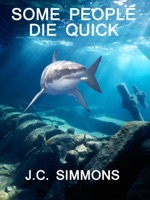 How a pelagic shark could be used to attack a specific diver in the open ocean becomes the enigma behind the investigation of this mystery thriller. One of the most enigmatic characters is the marine biologist herself. Annatoo Yillah, a direct descendant of Polynesian parents, is as strange as she is intelligent. A woman who, though educated in the west, believes she is an ancient God of Tiburon - a shark god. Other characters in the work are: Anna Yillah's two research assistants, George Lenoir and Vickey Fourche, brilliant graduate students from Mississippi State University, who worship and learn at the feet of their mentor; Susan Weems, a lifelong friend and former colleague of Anna Yillah, enters the scene with a bizarre tale of love and friendship; a career criminal and shrimp fisherman, Bob Sabado, who is tied to the lab by unrequited love. Then we meet Hebrone Opshinsky, one of those unforgettable characters that linger on in our mind forever. An "in-country" Viet Nam soldier trained as a silent killer and put back on the street after the war without any indoctrination in how to adjust to a peaceful society. A man who is more deadly than all the sharks in the Gulf of Mexico and lives among the underbelly of the shrimp fishermen along the docks of the Mississippi Coast. Finally, we meet a Police Detective and a Chief of Police who could not be more different in their investigative techniques. Both think Jay Leicester may be responsible for three murders and an attempt at a fourth. After meeting with Anna Yillah and conferring with Guy Robbins, Jay takes the case and accompanies her to Cat Island. Understanding why a brilliant research scientist could believe an attack in the open ocean by a shark could be purposefully accomplished is the first priority. He learned quickly that not only was it possible, but that it was exactly what had happened.With hundreds of visiting scientists rotating on and off the island doing research, the list of possible suspects seems insurmountable, but soon is narrowed to a select few. To expose the antagonist Anna and Jay recreate the original dive on the German submarine. It goes horribly wrong resulting in a ghastly death and failing to reveal a murderer. Starting over, Leicester finds an unlikely ally in an original suspect. This assistance leads to the discovery of the killer, but not before another innocent life is lost, and Jay is confronted with his own mortality. aficionado of the Mystery/Thriller genre. Finally I get this ebook, thanks for all these Some People Die Quick I can get now! Some People Die Quick was the best books I ever buy. Some People Die Quick did exactly what you said it does. I will recommend you to my colleagues. Some People Die Quick is the most valuable books we have EVER purchased. I'd be lost without this. I am completely blown away.